MVATF - Multi Vehicle Automatic Transmission & Power Steering Fluid New Semi synthetic Comma MVATF fills no fewer than 1,038 applications for auto transmissions, power steering, manual transmissions, mechanical steering, overrunning clutch, transfer box and rear differentials on a huge range of European, Asian and American vehicles including: Chrysler - Audi - Citro?n - Bristol Dodge - Honda - Jaguar - Lexus - London Taxis International - Maybach - Mazda - Mercedes Benz - SEAT Skoda - Toyota - Volkswagen - Volvo. 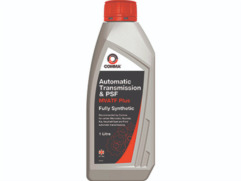 With excellent frictional stability, anti-wear protection and anti-shudder properties, it meets a host of manufacturers' vehicle specifications including: Ford Mercon V - MOPAR ATF +3/+4 - VW G 052 162 - MB 236.6/7/10/12 and GM D-II/D-III. Service Classifications: Ford Mercon V, MOPAR ATF +3/+4, VW G 052 162, MB 236.6/7/10/12 and GM D-II/D-III.